DANVERS: A worker for Witch City Roofing of Salem fixes the 100-foot flagpole in Danvers Square on Wednesday. 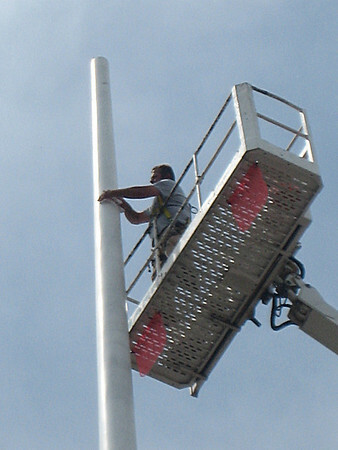 The worker was replacing the bucket-shaped "truck" at the top of the pole that spools a 216-foot stainless steel cable used to raise and lower the town's 25-foot-by-16-foot flag. The work was scheduled to be done so the flag could be back in the Square by Memorial Day.